WE HEART…Philosophy Hope in a Jar – I Heart Hair, Inc. If you are always trying to keep your youth, try Philosophy’s Hope in a Jar. This product was created for medical use to help reduce the appearance of wrinkles, skin discoloration, rough texture and dehydration. 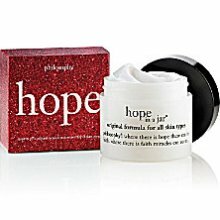 Hope in a Jar visibly repairs skin’s radiance and gently exfoliates, revealing smoother, healthier looking skin. The 2 oz. jar will run you about $38.